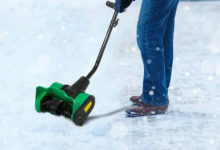 The premise behind a snow thrower is quite simple: if you don’t want to get complicated, think of it as a lawnmower but for moving snow! There are many different types, makes and models available, and each has its own excellent attributes, so it pays to have a closer look at some of the best ones on the market before you make your choice. Can you afford one? 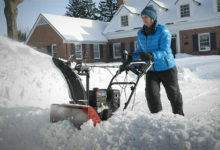 Look at it this way: manually shoveling snow in the morning – or at any time of day – really is hard work, especially if you live in an area where heavy falls are the norm, so the few hundred dollars you will invest in one of these will easily pay itself back over the next few years. Once the season is over you can simply park it away in your garage, and bring it out next winter! As we already said, there are many different makes and models on the market, so we recommend you check out our reviews of selected models – we have chosen those we think are the best in terms of performance and value for money – for all the information you could possibly need. 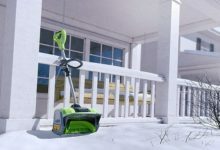 The review below is about the Husqvarna ST 224P 24-Inch Two-Stage Snow Thrower, which we know is one for the shortlist, so read on and learn all about it! Before we say anything else, let’s just say this: Husqvarna is a company with a long and illustrious history of designing and manufacturing machinery of this type (did you know they also manufacturer motobikes? ), so we start on a good note by picking a model from one of the biggest brands in the business. There are ‘discount’ brands on the market – as with every type of product – but it’s about economies of scale: you might save a couple of hundred dollars, on a model from a lesser brand that is apparently of similar specifications, but with the likes of Husqvarna you get the reassurance of many years of experience, a sensible warranty, guaranteed reliability and a longer life. So, what is it about the Husqvarna ST 224P that makes it one for us to feature in our snowblower reviews? 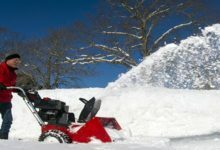 Beyond the brand, there’s the fact that this model comes with a whole host of impressive features, so let’s have look at what you want from a snow thrower, and why this model offers you all of that. 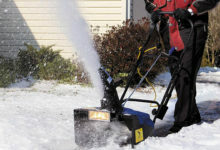 First, you want a snow thrower that is powerful enough to deal with your area of clearance; whether you have a small area that gets snow covered, or a larger one, you need to be able to cut back on the time and effort taken to clear the snow by using the machine. 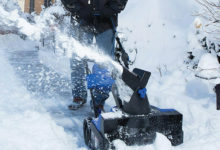 You also want a machine that is easy to use and not expensive, and one that is cheap to run and low-maintenance, so you can get the most cost-effective results from your snow clearing. Let’s talk in more detail about some of the features of the Husqvarna 224P, and why they make it worth your consideration. First, we like the fact this is a walk-behind model as that makes it far easier to use than some others; this convenience is typical of the Husqvarna design team, who always focus on user-friendly touches and make sure that the selling points are there to see. This is a good-sized engine and makes things a lot easier when it comes to dealing with large amounts of snow. It’s a hi-tech and very modern design that promises reliability and ease of use, and you will find it more than adequate no matter the size of area you have to clear. Also, it has an electric starter; this is an important feature when you are looking to get up earlier and clear your drive on a cold morning, as it means you don’t have to worry about getting it up and running. The engine itself provides plenty of horsepower and torque for one of its size, so you can rest assured you have plenty in hand to perform the tasks you need doing. For further ease of use, the engine is linked to the transmission via a friction disc coupling, which makes it perfect for the purpose. You also get six forward speeds; this may sound excessive on a snow thrower, but once you get to use it, you will realize how advantageous a variety of speeds can be. For heavier snow, for example, you may need to lower the speed in order to clear the ground properly, while a light covering can be done quickly on a higher speed. You also have a reverse gear, which means you can maneuver the machine with ease wherever you want to be. The Husqvarna ST224P comes fitted with 15x5inch heavy-duty tires that are specially designed with tread to take them through the hardest of snowfalls. This makes your job a lot easier, and will be a welcome feature once you begin to use the machine regularly. Now for what may be the important bit, the clearance ability. We found it quite amazing that this machine can clear as much as 23 inches in depth and 24 inches in width – that is more than adequate for very impressive and fast clearance of even the heaviest of falls, so you can be sure that you have the machine that is best for your clearance area. It does so efficiently, too, using the latest technology, and will easily perform when you want it to in even the coldest of weather. 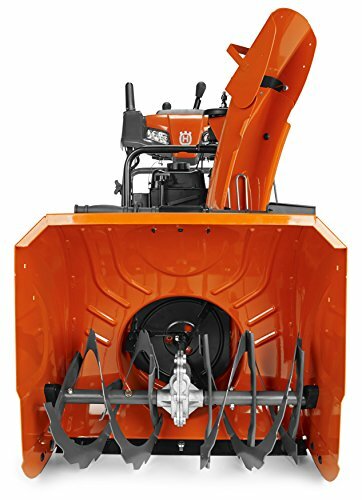 The machine is designed with many adjustable fitments so you can clear your snow effectively. For example, the chute – through which the snow is despatched – can be adjusted through 180 degrees, making it highly adaptable, and is adjusted using a simple control that is within easy reach at all times. The machine offers a maximum discharge distance of 35 feet – more than enough to clear you a passable area – and this is also variable as per your requirements. One clever feature of this area of the machine is that it mixes air into the snow, so you get a more efficient clearance. Those are just a few of the many features of this excellent machine, but before we move on there are some more aspects we want to talk to you about. The above are the main technical details of the Husqvarna ST224P, and we would also like to talk to you about some of the other features that make this a great machine to have tucked away in your garage for the winter months, particularly those that are for your convenience. The LED headlights on the Husqvarna ST224P are well worth highlighting, as they are a very important part of the package. Imagine the scene: it’s a freezing cold winter morning, you’ve had 15nches of snow in the night and you need to clear it to get the car out and go to work. Fortunately, your Husqvarna ST 224P snow thrower has powerful headlights that allow you to clear a perfect area in the dark, in no time at all, and with ease. That’s why the headlights make a lot of sense! This feature allows you easy adjustment of the space between the ground and the clearing tool – the auger – so you can make sure you have your Husqvarna ST224P set up perfectly for the very best performance, no matter the size or scope of the area and depth you have to cover. It’s a great feature that makes this an even more effective machine. With what we think a quite brilliant touch, the Husqvarna ST224P features heated handles – and they heat up almost immediately – for comfortable operation in even the coldest of weather. The handle is also a one-handed affair for added versatility, and is ergonomically designed for added grip and ease of use. Such attention to the comfort of the user is typical of Husqvarna, and is just one reason why we recommend this brand very highly indeed. For the record, the handle can be adjusted to three different heights, so you can find your own comfort level and it can be adjusted to suit anyone else who may have a need to use it. The Husqvarna ST224P may not be the smallest snow thrower on the market – but any more compact and you will lose not only the efficiency but the ability of the machine – but it is not the largest either, and its clever design means it can be stored away when not in use without taking up too much space in your garage. This Husqvarna model measures 58.5 x 24inches, and is around 40 inches in height, and with a weight of around 199lb ranks among the lightest models of its type. All of this makes it suitably compact to tuck away in a corner without getting in anyone’s way, ready for the winter months when it is required. So, that’s a pretty good summary of why the Husqvarna ST224P is a machine that is worth considering when looking at available snow throwers, and we hope that we have given you a good idea of what to look for. The only question is – is this the model for you? 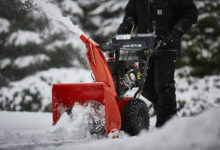 Of course, we recommend you read our other snow thrower reviews, as there may be more you want to consider, but for now, let’s have a quick conclusion as to why this is a machine that ranks highly on our lists. We feel we’ve given you a good feel for this particular snow blower with our Husqvarna ST224P review, so now we need to consider this: is this the model for you? There are many reasons why it may be, but before you do make a decision we recommend you check out our other reviews. It is compact in design and is light compared to many models in this class, so can be used by anyone whenever it is needed. One further reason we think this is worth considering takes us back to the beginning; with Husqvarna, you get excellent after-sales back-up and a great warranty – a full 3-years for parts and labour, and a massive 5-years for the engine – so you have that added peace of mind. Overall, we think that the Husqvarna ST224P is a sensibly-priced and very capable machine that may well be the one that suits your requirements, so have a look at it again and compare it to our other Husqvarna snow blower reviews, and see what you think. 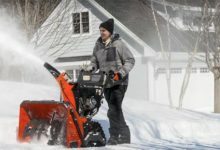 If the Husqvarna ST224P is a little out of your price range, head over to our review of the Craftsman 88173 or browse or full collection of snow blower reviews and see if anything else suits your requirements and budget better. I just love your reviews! The time you put into these is amazing! 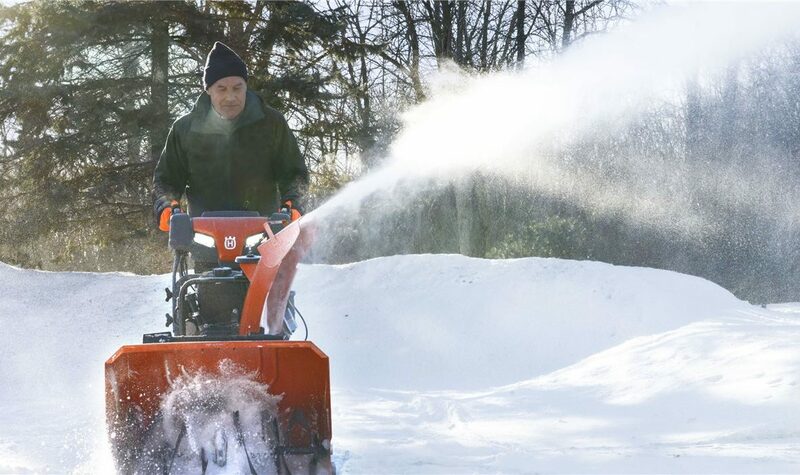 I am looking at buying my 1st snowblower and use it as a part time business clearing sidewalks (now that I retired)….so ALL i put is most appreciated!